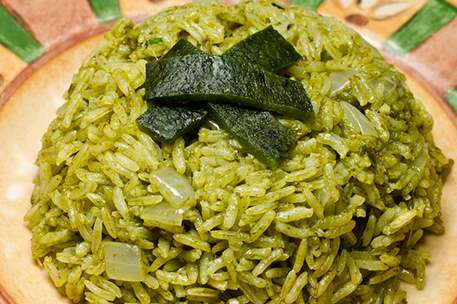 Rice is served often in Mexican homes. It ranges from plain white rice to more elaborate dishes like this one that can be a meal in itself. The area around Morelos in central Mexico produces a rice that is favoured by good cooks, since it has a large, fat grain that gives an excellent result in casseroles. Processed, quick-cooking brands should never be used in Mexican cooking. - Soak the rice for 5 minutes in warm water, rinse well and drain. - Rinse the spinach well, place it in a saucepan with no added water, cover and cook over low heat for 5 minutes. Transfer to a blender, add parsley, onion, garlic and ½ cup (4fl oz/125 ml) water and purée. Set aside. - Heat the oil in a skillet, add the rice and sauté for 5 minutes, stirring constantly. When the grains begin to separate, remove from the heat and drain off the excess oil. Add the spinach-parsley purée to the skillet and sauté for 2 minutes. Add the hot water and salt to taste. When the mixture come to a boil, lower the heat and cook, covered, for about 20 minutes or until the rice is tender. - Meanwhile, preheat the over to 350ºF (180ºC). Melt the butter in a large skillet, add the onions and chile strips and sauté for 5 minutes or until tender. Sprinkle with salt. - Grease a ring mold and arrange a third of the onions and chiles in the bottom. Cover with half the rice and add half of the cheese. Cover with the rest of the rice. Cover with foil and bake for 10 minutes. Turn out the mold onto a platter. Cover with cream and sprinkle with the remaining grated cheese. Place the remaining chiles and onions in the center of the mold. © 2018 All rights reserved. Destination Mexico.